No-one loves a jam-packed calendar of soirées and sporting events more than us Brits. Here we shortlist the best social events month by month, alongside the best places to stay. After soaking up the atmosphere, what better way to unwind than from the comfort of a blissful home-away-from-home? You'll have heard of the January Blues, but have you heard of the January Jumps? Claiming to be one of the oldest racecourses in the country, Exeter Racecourse sits high on Haldon Hill and opens its gates on 24th January for spectators to get up close to the horse racing action. Don your country hat and immerse yourself amidst the thundering of hooves and the cheering chorus of those who have had a flutter, in turn, playing out the soundtrack to your day. Pencil the 17th February firmly into your diaries for Blenheim Palace’s first ever foray into Chinese New Year celebrations. This historic home will play host to a traditional Double Guan Yin Chinese Lion dance accompanied by a drummer banging out heart thudding beats, all once visitors have tucked in to authentic Chinese street food in the Great Court. With spring rolls scoffed, head inside the palace to warm up beside the fire and discover the magnificent Great Hall adorned with strings of Chinese lanterns. Saddle up for a day at the races and enjoy the atmosphere at Cheltenham Festival, one of the most prestigious events in the horse racing calendar. Framed by breath-taking vistas of the Cotswolds countryside, gather your family and friends from 13th March for a thrilling experience watching some of the finest thoroughbreds gallop to glory. Nothing signals the start of spring in England more so than the blankets of Daffodils that cloak the fields and pearly snowdrops peeking through the hedgerows. April is a wonderful time of the year to explore outdoors and the Peak District Walking Festival celebrates some of the best landscapes of the season, taking walkers along networks of trails that weave through river valleys and wind up hilltops. Grab your walking boots and head to the hills to participate in guided walks, uncover local legends, discover fauna and fauna and then leave with spring firmly in your step. Don't hit the hay tonight without taking a look at the famous Hay festival, an annual celebration of music and literature held in Hay-on-Wye. Taking place at the end of May, this cultural festival is suitable for those of all ages with activities ranging from craft workshops to creative writing masterclasses, poetry recitals, music events and much more. With the likes of Stephen Fry, Jacqueline Wilson and Elizabeth Strout previously headlining the tipi talks, this humble Welsh festival is fastly becoming known as one of the best British festivals out there. This June will see the iconic Lake Windermere play host to tens of thousands of swimmers compete in The Great North Swim, Europe's biggest open-water swimming event. With a diverse range of distances, the event caters to those of all abilities and ages, creating a wonderfully welcoming event for families. Set on the shores of one of the Lake District's most iconic locations, The Great North Swim promises to be an exhilarating event for both swimmers and spectators. WOMAD, or the World of Music Arts and Dance festival, is held each year in Wiltshire over the last weekend in July. Hosted within the grounds of the magnificent Charlton Park, WOMAD promises festival-goers a multicultural weekend full of global sounds. With a relaxed, friendly atmosphere, WOMAD is as popular with families as it is with those looking to dance until dawn. Taking place from 2nd August within Lulworth’s enchanted woodland estate, Bestival is a magical combination of music, circus, immersive theatre and much more. Known for its fancy dress themed days, this boutique festival is one of Dorset’s best events and should certainly not be missed. 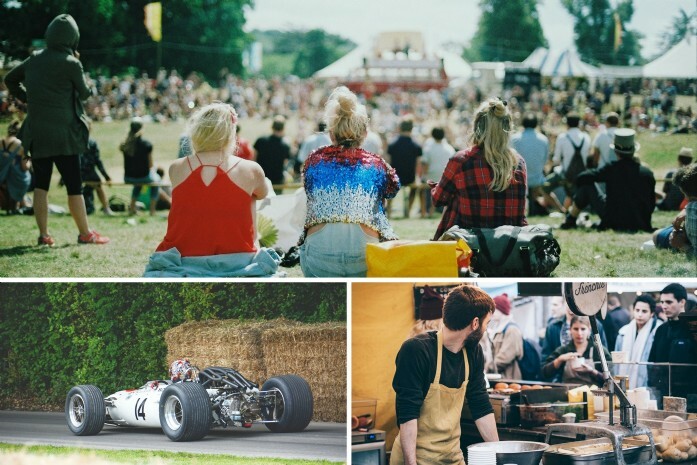 If you missed Goodwood Festival of Speed in July then be sure not to miss Goodwood Revival, taking place between 7th – 9th September. Wheel to wheel racing is at the heart of the weekend, seeing hundreds of classic cars compete for the coveted trophy. After the excitement of the track, head to the Revival Emporium where drinking, dining and shopping experiences await. Recently celebrating its 40th anniversary, the Guinness Cork Jazz Festival is an institution in southern Ireland. Cork has a compact city centre brimming with waterways, Georgian parades and 17th Century alleyways, thus creating a charming backdrop for the festivities. Time your visit over Halloween when Cork comes alive with a walk through horror event which is sure to get your spine tingling. Celebrated annually on 30th November, St Andrew’s Day is one of the highlights of the Scottish calendar. Recognised as a bank holiday in Scotland in 2006, traditional celebrations include a feast with music and dancing into the wee hours. Each town has its own individual way to honour the Patron Saint but you can expect fireworks, lantern processions, live music and whiskey tasting amongst the party plans. Longleat's famous annual Festival of Light returns once again, showcasing a stunning display of giant Chinese lanterns illuminating the magical grounds with activities suitable for all ages. Themed around a unique enchanted topic that changes each year, a visit to Longleat is guaranteed to stir festive cheer and get visitors into the Christmas spirit.